The protests of the past week reflect a growing sense of Hong Kong self-identity. At the stroke of midnight on July 1, 1997, Hong Kong’s first chief executive C.H. Tung declared that the city’s return to China after more than a century of colonial rule marked the day that Hong Kongers became the real masters of their homeland. Yet today, seventeen years after handover, the people of Hong Kong still cannot choose their own leader. On August 31 this year, Beijing decided that Hong Kong’s political leader in 2017 may be elected by universal suffrage, with a caveat: the candidates running for office must be pre-vetted by a 1,200 member nominating committee controlled by pro-Beijing tycoons and elites. This angered many Hong Kongers, who believe that government-business collusion has contributed to long-standing problems, including an acute housing shortage, spiraling property prices, a yawning wealth gap, and declining social mobility. It is to Hong Kongers’ credit that they have turned their pent-up frustration with Beijing into a magnificent show of courage and resilience over the past week. Braving police deployment of tear gas, pepper spray and a looming fear of a violent crackdown à la Tiananmen, tens of thousands of Hong Kongers thronged the roads in the city’s business and shopping districts, armed with nothing but umbrellas, water and an unwavering faith in the values of freedom and democracy. While the catalyst for the massive civil disobedience campaign was Beijing’s denial of the right of locals to choose their own political leader, the root of Hong Kongers’ discontent runs deeper. Native Hong Kong people have a sense of identity that is distinct from that of mainland Chinese. This Hong Kong identity is underpinned by two key elements, psychological resistance to the Chinese Communist Party’s rule and a sense of entitlement in politics, both at odds with the Chinese national identity. As immigrants and descendants of immigrants who fled the socio-political turbulence of mainland China to seek refuge in Hong Kong from the 1950s to the 1970s, Hong Kong people harbour an inherent mistrust in the Chinese communist regime. Their scepticism was deepened by the 1989 Tiananmen massacre, which triggered an exodus from Hong Kong before its return to China in 1997. To assuage Hong Kongers’ fears, China’s late leader Deng Xiaoping coined the principle of “one country, two systems,” under which the city’s lifestyle, values and systems – such as an independent judiciary – would remain unchanged for fifty years after the handover. Ironically though, the high degree of autonomy granted to Hong Kong has reinforced Hong Kongers’ psychological distance from their mainland counterparts. Today, many locals see themselves as Hong Kongers or Hong Kong Chinese rather than Chinese nationals. This different imagination of Chineseness has laid the ground for the recent trend of rising localism, particularly among Hong Kong youths who take immense pride in their spoken Cantonese and written language in traditional Chinese, which differ from the Mandarin and simplified Chinese used by Mainlanders. The politics of difference between Hong Kong and mainland China is hardly an isolated case. Hong Kongers’ perception of their own identity and their attitude towards Beijing is analogous to that of Gibraltarians, who regard themselves as being Gibraltarian or British Gibraltarian but not Spanish. Precedent can also be found in the relationship between Catalonia and Spain, and more recently, that between Scotland and the United Kingdom. Within mainland China itself, the “one country, two systems” formula was first tested in Tibet. Now that Beijing’s experiment to preserve Tibet’s way of life under the seventeen-point agreement has proved to be a failure, more Hong Kongers are concerned that today’s Tibet mirrors tomorrow’s Hong Kong. 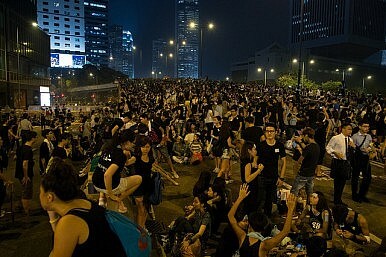 Amid the city’s diminishing freedom and civil liberties, especially over the past decade, a common refrain among Hong Kong people is respect for the principle of “one country, two systems.” Yet Hong Kongers’ interest in upholding their city’s autonomy has been disregarded by Beijing, which has instead adopted an increasingly interventionist approach to the governance of Hong Kong. A good case in point is Beijing’s attempt to introduce compulsory patriotic education to schools two years ago, which was shelved only after outraged Hong Kongers rallied against it in a movement led by young students. Contentious in nature but remarkably peaceful and orderly in form, the anti-national education protests accentuated Hong Kongers’ sense of identity vis-à-vis their mainland counterparts and planted the seeds for today’s civil disobedience campaign, similarly initiated by student groups. The revitalized Hong Kong identity means its two components – resistance to the communist regime and a sense of entitlement in politics – have also been strengthened. Whereas tensions between Hong Kong and China may be mitigated if Beijing had adhered to the “ one country, two systems” model and granted Hong Kong genuine democracy, it has instead endeavored to restrict the city’s autonomy first through the issuance of a White Paper in June, followed by its non-compromising stance on the 2017 election of the Hong Kong chief. On these counts, the ongoing civil disobedience campaign in Hong Kong seems to have been an event waiting to happen. Although pro-Beijing voices have stressed that the proposed electoral plan will let 5 million eligible voters select their future leaders, protestors remain unconvinced and have demanded genuine universal suffrage without prior vetting of candidates. Beijing has reiterated that it will not retract its decision and has condemned the civil disobedience campaign as illegal. In the meantime, however, the people’s sporadic and innovative acts of resistance have, as a Chinese saying goes, blossomed everywhere in Hong Kong. Kin-ming Kwong is a former research assistant at the East Asian Institute, National University of Singapore and presently a public policy consultant in Hong Kong. He contributed essays to the book Hong Kong under Chinese Rule and has written widely on Hong Kong issues. Chiew Ping Yew is research fellow at the East Asian Institute, National University of Singapore. She is co-editor of Hong Kong under Chinese Rule and has written on many socio-political issues in Hong Kong.